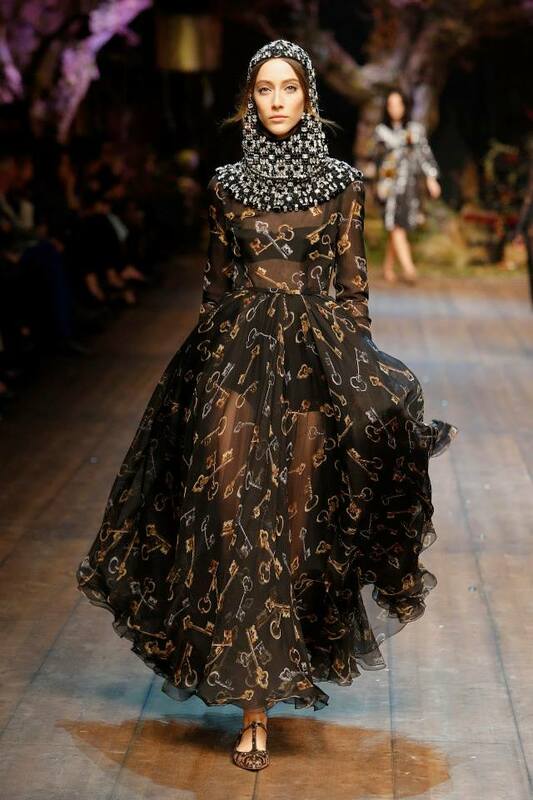 Dolce & Gabbana Fall 2014–Designers Stefano Gabbana and Domenico Dolce traded in last season’s Sicilian imagery for fairy tale fashion with Dolce & Gabbana’s fall-winter 2014 collection presented during Milan Fashion Week. Set against a dreamy forest backdrop, models hit the catwalk in an enchanting mix of medieval hoods, daytime dresses, floral embellishments and light and airy gowns that look like something Sleeping Beauty would wear. Woodland creatures such as owls, squirrels and foxes embellish swing coats. The Dolce woman accessorizes in colorful jewelry on her neck and ears while gems are strewn across boxy clutches and gloves.